Therese Walsh is the author of The Last Will of Moira Leahy, which is already racking up the raves. Says Booklist, “Walsh’s debut is a magical, involving journey, one that mixes a compelling mystery from the past with a suspenseful search in the present.” Therese offered to do a guest blog, and her "I had to write it" is, I think, in the soul of every writer I know. I began writing this story in 2002 as almost a writing exercise. I’d been writing children’s picture book manuscripts, but I’d become increasingly enamored of longer words and meatier stories. I decided to give myself a bigger canvas: adult fiction. I thought, at first, that I would write a romance, a traditional love story, but as I wrote my story veered off into unromantic territory. Originally, the main character, Maeve Leahy, did not have a twin. But one day, Moira was just there, explaining her sister’s behaviors and trauma. And there was a Javanese keris involved in the story, demanding its fair share of attention. You can see the problem, I’m sure: When I submitted the book, it was rejected by agents—not for lack of voice or unique content, but because it was too much of a square peg. It was structured like a romance, but the breadth of the novel didn’t fit the genre. One agent suggested I should be writing women’s fiction. Deep down, I realized that agent was right. What was I going to do? Begin a new book? Quit entirely? The timeline is a little fuzzy, but 2004 was a big year for mulling over my options. I did a lot of thinking, a lot of reading in the genre of women’s fiction, and a lot of craft work. All the while, my rejected project writhed in the “unfinished business” category of my mind. There was no use fighting it. I salvaged one critical scene from the old draft and started over again in 2005. Then I scrapped everything again in 2006 and started over for a third time. Maybe I would’ve quit but my characters refused to leave me alone. You know that feeling you get in the pit of your stomach, that disquiet you feel when you know something needs to be done and it’s important and you’re messing up? That’s how I felt whenever I wasn’t working on this project. When I was at least actively thinking about it, the anxiety eased. And so, little by little, I worked through the last draft. In 2008, I finished polishing the women’s fiction version of The Last Will of Moira Leahy and found an agent, Elisabeth Weed. 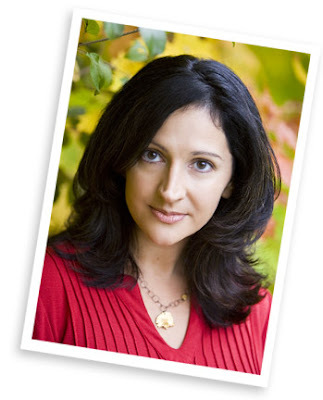 Shortly thereafter, she sold the book to Shaye Areheart, an imprint of Random House, in a two-book deal. How do I feel about my second book, my work in progress? A novelists, we struggle to put the truth on the page. We hope to tunnel so deeply into our characters' lives that what is on the page feels absolutely and complete real-so real that we fully expect the characters to walk past us. But we novelists also deal with some people thinking that what we have written is really about us personally, about our lives, that even though it is fiction, it is also absolutely true. I can't tell you how many times people have asked me what is going on my life because of what I have written. (Sometimes it's nothing!) Or people imagine that the husband in the story is my husband, the main character is me, or that I am opening a window into my personal life, when actually I am inhabiting another world, I am living another life through my characters. 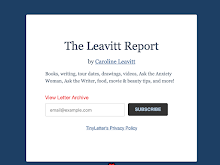 While certainly I write about the issues that obsess me, I'm not writing diaries. Recently, the writer Leora Skolkin-Smith told me that she had gotten a letter back from a great publishing house about the submission of her new novel Hystera, which is this ravishingly good book about mental illness in the 70s. The editor felt the book was halfway between memoir and fiction, something that astonished both of us. What was she saying? That the book sounded so real that it felt like memoir? That she wanted it to really be a true story instead of a made-up one (and why would she want that? Do memoirs sell better than novels?) But don't we want our fiction to be so real that we feel we are a part of that world? Isn't that a good thing? 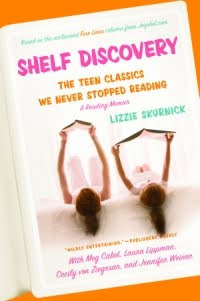 Shelf Discovery: The Teen Classics We Never Stopped Reading by Lizzie Skurnick (who also has a great blog). Why do you think teen novels resonate so deeply with the adults we’ve become? Do you think that just as music catapults us back to a specific time and place in our lives (we might remember our first kiss happened with Blue Oyster Cult raging in the background), so can certain books? I think that once you reach an age where childhood is firmly in your past, you suddenly start to be able to see what has made you the person you are. It's not surprising to me that most of the women who read Fine Lines and write me about Shelf Discovery are between 25 and 45. It's like we've all suddenly woken up to a part of ourselves we'd completely forgotten, and it's so great to remember how deeply we felt when we were that person. What I loved so much about the book was how you reflect on how rereading gives new meaning—from a different perspective. Was there any book you loved that you now can’t stand? You know, it was really terrifying to write this column and this book, because I was always afraid of losing a favorite book in the process, realizing it was kitschy and horrible. But I was relieved at the end to find the only book I lost was one I'd only liked for its lurid factor anyway: 'Go Ask Alice'. To a grownup, it's a clumsy ridiculous read, and so patently made up it's almost funny. There was a detail I loved: that the main characters gives her hair that 70s wave by rolling it around old frozen orange juice cans. But I'm keeping it. It seems credible enough. What do you think of the state of YA novels now? Any modern day author who springs to mind that you think will affect future generations the way Judy Blume does? It's so difficult to tell what any generation will choose when you're not part of it. So many of the books I write about have issues related to the rise of feminism and cultural repression in general -- mothers going back to work; sadistic teachers; unchecked bullying; bullying dads; divorce; alcoholism. These are issues we discuss so widely and publicly today that they can't have quite the same explosive power they did for us. Also, a lot of these books were about not being noticed or being noticed only in a negative way by your peers or parents. I don't think schools, parents and peer groups are allowed to be quite so Darwinian today. (Not out in the open, at least.) I find the move of the market to fantasy interesting -- I wonder why the YA books of today have shifted into an allegorical space. Judy Blume, Paula Danziger and Paul Zindel wrote works that took place only entirely in the classroom, making a universe of what happened to five people over a year. Even Meg from 'A Wrinkle in Time' gets in fights at school. I noticed that most of the titles are geared to girls, though you do have boy titles in your book. Why do you think this is? Were these books just more geared to females? I think in this period of women, a lot of women writing stories of their own youth for the first time, and obviously they were published with girls on the cover. But I think it's less about marketing -- who marketed anything then? -- than about the types of stories children enjoy at different ages. After all, so many of the writers -- Richard Peck, Robert Cormier, Paul Zindel -- were men, and so many of the books star men. ('Then Again, Maybe I Won't' is still one of my favorites.) It's less that the books were geared toward girls than that, at that age, girls are more interested than boys in these sort of psychological, dramatic narratives. I have to ask and no one has ever been able to help me on this one. When I was ten, my mother allowed me to read whatever I wanted, no questions asked. She handed me three library books, all set in Paris. All I remember is the characters, Pierre, Elizabeth and Sally. I was shocked when Pierre lustily ripped open the jacket of his girlfriend to reveal her “heaving breasts”, sending the buttons scattering, but even more stunned when Sally grew up to go to New York City and have an abortion. I devoured the books and would love to find them again. Do you have any idea what they might be? Hmmm...I have no idea! Definitely tell me when you figure it out, though, so I can read them too. They sound excellent. Is there a sequel in the works, I hope? I'm definitely going to keep writing Fine Lines! The rest is up to the publishing gods. You talk about the pleasure of the covers of these books, and I have to agree. Although many now look old fashioned, there is still something in them that makes you feel you are eavesdropping on a life and you want to come closer. What else is it about these covers that made them so important to all of us back then—and maybe now, too? I think it's that the girls are actually facing us, and they're normal girls, surrounded by all of the objects in their lives. We can see them as clearly as we would walking into a friend's room. Now, books rarely show a girl in any context at all. Usually, it's the chop-shop style: a foot, half a face, even sometimes just a fluttering dress in the wind. Some of Judy Blume's books have been put out without any images on the covers at all. Even my book suffers from this syndrome: I don't like that the girls are lying down, and that we can't see their faces. All of the girls on these old covers are face-front and in the center of the action, and that also reflects the spirit of these books. What question should I be mortified that I did not ask you? I would never want you to be mortified! But you didn't ask me my favorite book. Luckily for you, I mention it in every other print and radio interview. I've been thinking a lot about how writers see the world. Recently on Facebook, a writer I really, really admire (the extraordinary Rhian Ellis, who wrote After Life, which I've written about here before) was telling me how she had been arrested for protesting some white supremacists in her neighborhood. I instantly peppered her with questions. What did it feel like to be in a cop car? Did she have handcuffs and did they hurt her wrists? What did the cops say? I kept seeing the pictures in my mind, imagining the story, carrying it further than what she had told me. "Caroline, you're such a writer!" she said, and then she said that the thing she remembered about the experience was that she was trying to make story out of it. She was seeing characters and plots, beginnings and ends and a story arc. I know this feeling all too well. I asked her, "Do you ever stop in a moment of intense emotion or drama and think: I can use this. Or: I need to remember this?" And she said Yes. Yes. Yes. Yes. But I'm of two minds. Sometimes I think we writers need to be more in the moment. Sometimes, a child coming over to us in a park is simply a child coming over to us, and not a child who was taken from his mother in a custody battle, or a child who had vanished who has suddenly reappeared. Sometimes it's important to just see and appreciate what is right there in front of us. But then again....this urge, this delicious compulsion to make a story of everything, is as natural and essential as breathing. 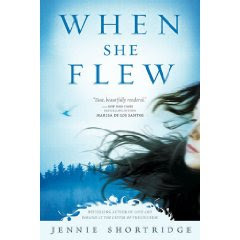 When She Flew by Jennie Shortridge is the kind of dark, involving novel I happen to love. Based on true events concerning a Vietnam vet raising his young daughter in the woods (and succeeding at it), When She Flew delves into questions about family, society and love itself. Thanks, Jennie for answering my questions. I know that this book is inspired by true events, which you have fictionalized. What were those events? Did you speak with any of the people involved? Do they know about the novel and have they read it? And where are they now? In 2004, Portland Police found a Vietnam vet raising his twelve-year-old daughter in the woods. The girl was healthy, articulate, home-schooled and reading far above her grade level. A doctor’s exam ruled out abuse. The police sergeant in charge was a single dad at the time, and he felt strongly that the two should be allowed to stay together rather than be put through normal channels that would separate them until the father was determined a fit parent. The sergeant broke protocol and took them to a shelter for the night, then found them a home on a friend’s farm. I wanted to write a story about these events, but I didn’t want to write about the actual people involved, for their privacy. Plus, like any fiction writer worth her salt, I wanted to make it a story of my own imagining. I contacted the police sergeant, and after emailing for a while, convinced him to have lunch with me. I took the train from Seattle to Portland for this lunch date, and by the end of it, he was excited by the project as I was. He’d never given interviews to anyone during the case, and had turned down media requests from Good Morning America, the Today Show, and others. I spent the next year emailing him questions about everything from how he felt during certain events to what cops wear on their duty belts, how long their shifts are, what equipment is in a police cruiser. We hiked into the woods one hot August day and found the encampment the real people had been living in. His input was invaluable to my writing about the story in a real way, even while fictionalizing so much of it. The real father and daughter left the farm after only two weeks, worried that the media was trying to track them down. I wouldn’t have wanted to talk with them even if I’d had the chance to, though. I wanted to reinvent characters that were nothing like them, because I sensed how exploited they already felt. The novel seems to me to be a lot about how we define home and family, and how the norm is not the only way to do it. Can you talk a little bit about that? This seems to be a topic I examine in almost every book: what constitutes a family? What makes a home? This father, who deals with his own post-war issues, is able to create a home off the grid for his daughter and do a pretty good job of ensuring she’s well cared for. He takes her to church every Sunday, to the park once a week so she can play with other children, and educates her beyond her grade level. The fictional police officer in the story, Jessica Villareal, wonders if she’s done half as good a job with her own daughter, who is now estranged from her. I don’t believe that there’s only one “right” way to do anything, especially when it comes to home and family. There’s juxtaposition in the book between what society might think is best for these people and what they feel is best for themselves. Ray, the disabled Iraqi veteran refuses to go to the places allocated for the homeless, and Lindy lives in the woods with him rather than going to a foster home—and yet, they both have rich lives. How good a job do you really feel society does when it comes to ministering to people? I think it’s one of the most difficult challenges our society faces: how do we best care for those who are in need? And what if those in need don’t want the help? I would not presume to say that those who work in social services aren’t doing the best they can, because there are so many factors at work: political, financial, legal. There are heros and scoundrels in every profession. The aspect of the true story that really intrigued me was how the police sergeant decided to try to help these people in a decent, caring way rather than by the book, even though he might have to face the ramifications of that decision. When She Flew says a lot about daring, and gaining release from damaged pasts. Jess, the police officer who feels she has lost everything important to her, doesn’t want to disturb or uproot Lindy and Ray. Lindy and Ray dare to live outside in an Oregon forest. Do you think we ever can escape our pasts? And should we? I think we escape, or rather transcend, our pasts when we dare to do something courageous, as Jess does in the story by breaking the rules. She sacrifices everything she previously held sacred, but it’s the pain of losing her daughter that drives her, and ultimately, reconnects her to that daughter. Your tagline on Redroom is “striving to reveal truth and beauty, while telling a good story.” So, how does one do that? Well, the key word is striving! It’s my life mission, and one that is a work in progress. Fiction seems the best way to reveal the emotional truth, in my estimation, if not the actual truth, and to point at the small and fleeting moments of grace we miss in real life, but recognize when reading about them. We all have this sense of what is meaningful, but sometimes it helps to be reminded of it in a surprising way, while reading a book, watching a movie, talking with a friend. I feel that’s my job as a writer, to point those things out while unraveling a story the reader feels emotionally invested in. What does your daily working life look like? With the publication of four books now, it’s different every day. I used to wake up and take my second cup of coffee into my home office and write all morning, but these days it’s more complicated. I eke out writing time when not working on promotional efforts or organizational housekeeping, when not trying to keep up with social networking and correspondence and requests and book groups and all of the things that make my life rich and full, but short on writing time. I write on trains and planes, in hotel rooms and lobbies and coffee shops. I need to do better at all of this, but I think I’m like everyone else right now, just trying to keep up with so many new things and technologies, and still tap that creative vein on a regular basis. What’s next? I’m now working on a novel about a rare condition called “dissociative fugue,” and what happens between an engaged couple when one of them experiences it. I believe it’s my first true love story. 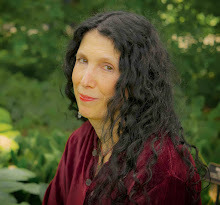 Laura Kasischke is one of my favorite authors. She has this eerie ability to meld the everyday with the unsettling, to unpeel her characters' lives with astonishing grace and beauty, and to craft novels that continue to resonate months after you've turned the last page. My copy of The Life Before Her Eyes is dog-eared, and I suspect the same fate for her newest, In a Perfect World, about family, step-parenting, betrayal and love, all set against the apocalyptic world of global flu. Thank you so much, Laura for answering all these questions. The flu seems to me to be the perfect end of the world scenario—not the bomb, not terrorism, but something organic. What made you choose it? I was reading the book THE GREAT MORTALITY by John Kelly, a history of the Black Death. Actually, it was two summers ago, and I was reading it mostly in a chair at the edge of the public pool while keeping an eye on various kids in my care, and the writer’s question occurred to me: What if? What if a plague happened here—starting slowly, caused by things we couldn’t understand, trickling across the landscape in terrifying bits instead of the cataclysm we often dread, like the bomb you mention. Who would we become? So, it was the combination, I guess, of reading that book and being a not-very-relaxed person in this sunny, sweet place and time, that got me thinking. You have this wonderful, thrilling ability to walk a thin line between the matter of fact reality and the impossible-to-imagine, and both seem equally real. You did this in the very fine The Life Before Her Eyes, and it’s here too, in the day-to-day juxtaposition of a stepmother grappling with an absent husband and step kids who seem to hate her. I’m wondering where that sensibility comes from and how much of it impacts your own life. Well, I’m definitely a worst-case-scenario kind of person. Luckily I have the outlet of writing so I’m able to avoid a complete neurotic meltdown most days—but I do think I tend to find myself noticing the potential, often unpleasant, for surprises beneath those ordinary stones. The other thing I found fascinating is there is no one real way to categorize this book. It’s got a hint of sci-fi in that it’s futuristic as it deals with the flu, it’s most definitely a rich human drama, it’s a story about step-parenting, but it’s also a kind of love story, because as things get grimmer and more menacing, this family unit gets warmer, richer, and they become something truly unique. How did you personally see this novel? I wanted it to be, I suppose, a kind of fairy tale. I might say ‘fairy tale gone wrong,’ but I do feel that, in the end, the fairy tale is redemptive. At the outset, the protagonist is a kind of woman like one I’ve been myself off and on at various points in my life. She wants romance. She sees romance as a particular kind of thing, and perhaps it’s got less to do with reality than things she’s read about and movies she’s seen. In the end, she does not have the fairy tale romance she wanted, but by rising to the challenges she’s given, she has something richer and more important, in my opinion. I knew that a step-family would ‘instant conflict,’ and that an epidemic sweeping the land would be upping the ante on that considerably, so I tried to keep the focus on the domestic details, and the crises in the larger world acted as a kind of landscape, a stage set. This is also how I imagine such disasters occur in real lives: first a distant rumor, and then for long periods a peaceful denial, and then a little closer trouble, followed by a reprieve and a forgetting, etc., and in the meantime you’ve got to scramble some eggs for your kids and get the laundry folded. You’re also an acclaimed poet, which explains the gorgeous writing, (impossibly beautiful images, amidst startling violent ones) but you also seem to have no (at least no visible ones) struggles with plot. How does being a poet impact your writing, or are the two apples and oranges separate? Thank you so much for saying that. The kind of writing I really love is sensual stuff—the sky and the weather and smell of your kid’s hair—so I work extra hard when writing a novel to give the reader something to fear or anticipate or a question to find an answer to, so he or she will be more likely (hopefully) to indulge my lingering on images so long. The Life Before Her Eyes became a film—did you feel the different media enhanced your novel, too away from it, or made it become something quite different? Did you have an input into the film? I was happy with the film, not the least reason being that it was so incredibly flattering to have someone make a film of my novel! But I also felt that the director, Vadim Perelman, really liked the sorts of things about the novel that I myself was proudest of—the atmosphere, hopefully, and the imagery, and a kind of background of beauty and dread that I see as so akin to feminine, teenage life. I loved his first movie, The House of Sand and Fog, and felt that he brought a lot of passion to The Life Before Her Eyes, too. It was changed, of course, and, no, I did not have input, but I was very pleased with the film. I don’t want to give away the stunning ending, but I will say that it ends on a note of both high hope and major apocalypse—an unanswered question which left me unnerved and exhilarated at the same time. It creates what John Truby calls “the never-ending story” which makes the reader continue to tell the story to him or herself long after the last page because it’s so open-ended. Did you know how the book was going to end while you were writing? I did have the end in mind all along—that they would be a family, waiting, and that something was coming, they could hear and feel it, and they did not know what that was. The unsettling undercurrents of the book are leavened with a good deal of humor—i.e. a very famous pop star being a victim of the flu! But there are also elements of the fairytale in here, and interestingly enough, it’s more Grimm’s fairy tales than the more happy-go-lucky kinds. I’m wondering if that was a deliberate choice. Early, I knew that the scene I’d open with would be a stepmother and her teenage stepdaughters together on the day Britney Spears was announced to have died. The fairy tale choices were deliberate, too, and seemed obvious to me: Mostly they were the mother/child stories, which always involve so much conflict and heartache, especially Hans Christian Andersen’s. His “The Story of a Mother” was on my mind the whole time I was working on the novel—and if you haven’t read that one before, get out some Kleenex before you do! What are you working on next? I’m writing poems, and also trying to finish a new novel. It just gets longer and longer, though! What question didn’t I ask that I should have? Well, thank you for asking! How about, “Do you have anything against Britney Spears?” Absolutely not! I hope she lives to a ripe old age! I read their advance fiction lists like a menu at a four-star restaurant and jot down titles so I won't forget them. Now the wonderful Ann Chambers Theis is doing a Character Study Project. Authors are welcome to submit a character study for BookReMarks@overbooked, a part of Overbooked which is just starting up and will also be offering take five booklists (books related by theme or subject), book notes//remarks, and more. A character study might include a description of the character and details about what interests this character has related to reading, music, film and TV. And you can feel free to be creative. The form is here. You can read some character study examples here. What is so truly wonderful about this project is that you realize just how well you know your characters when you do this study, right down to what music they listen to while making breakfast (and you know just what they are eating, too, whether it is eggs and bacon or tofu and miso soup) to their secret penchant for trashy magazines. To my delight, I also got to get back into the life of a character I missed, and as soon as I thought about her, she began talking nonstop to me about books, music, movies and all sorts of things. She came alive again in a new way. Great project. Great writing exercise, too. And many thanks to the great, great Overbooked book site and to Ann! One of the things I most love about teaching writing at UCLA is how the writing journey doesn't end when class does. Writers stay in touch and I get to celebrate with them when they succeed. 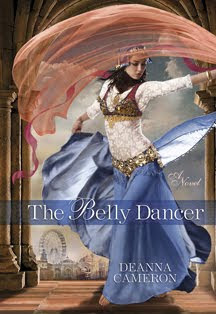 DeAnna Cameron was in one of my classes (one of my fave people, too), and I was absolutely thrilled when she sold her novel, The Belly Dancer. So, of course, I asked her if I could pepper her with questions and she graciously agreed. Thank you, DeAnna! So how did you get entrenched in the world of belly dance? It started back in college, when I signed up for a Middle Eastern dance class to satisfy a course requirement. And from the very first day, I just fell in love with it. I loved the way it felt to dance, I loved the music, and I loved how it got me out of my head. Even after my course requirement was filled, I found myself returning again and again to that class and others like it because I was having so much fun. And then, in class I would hear about these festivals and special belly dancing events. That’s how I discovered the really vibrant and wonderful belly dance community here in Southern California. But it’s not just here, these communities exist all over the nation. You can go to just about any town in any state and find belly dancers, if you know where to look. What was your research like? And who was the real Little Egypt? My research began long before I had any thoughts of writing a book. I was interested in learning about the origins of belly dance and particularly its migration to the United States. But when I discovered the belly dancing scandal that shook the 1893 Chicago World’s Fair, that’s when my writer instincts kicked in. I knew that would make a great backdrop for a story. So that’s when my research became more focused. I collected every book I could find on Little Egypt, the World’s Fair and 1890s Chicago; scoured university archives online; studied the fashions and daily lives of Victorian women; and visited Chicago and New Orleans to see the places I was writing about. As far as the “real” Little Egypt, I tend to agree with dancer and historian Donna Carlton, who wrote what I consider the bible on the subject, “Looking for Little Egypt.” Her exhaustive search came up with no evidence that a dancer ever performed at the fair by the name of Little Egypt. What Carlton found was the name actually became well-known a few years after the fair closed, during a notorious police investigation into an incident known as the “Awful Seeley Dinner.” At that dinner, which was attended by a number of prominent men in New York, a dancer by the name of Ashea Wabe, who danced under the name “Little Egypt,” was allegedly hired to perform an indecent dance. The police raided the affair, and that sparked the investigation. The story was carried in the New York Times and other newspapers across the country, and that made “Little Egypt” a household name. Can you tell us about the real life scandal involving the Egyptian belly dancers and the 1893 Chicago World's Fair? You have to remember this was the Victorian Era, and women were expected to wear clothing that obscured just about everything of their natural shape. The “proper” silhouette was something along the lines of a full, floor-length skirt, a miniscule waist (wrestled into shape by a corset), maybe a bustle, and exaggerated sleeves. So when the Egyptian dancers appeared in their ankle-baring skirts and tiny vests over thin blouses and no corsets, that alone caused a lot of consternation among the locals. Add to that the dance itself, with its shoulder shakes and hip wiggles, and you’ve got something that many people considered downright vulgar. Complaints were lodged with the fair authorities, and the local newspapers were filled with letters to the editor that called for these entertainments to be shut down. The criticism was widespread, coming from regular folks, as well as religious and civic leaders of the day. The Board of Lady Managers, the fair’s women’s auxiliary group that I write about in the novel, also opposed the performances and tried to ban them, but it’s worth noting that the board’s leader, Bertha Palmer, was quoted in the Chicago Daily News as wanting to work with the dancers, and not just shun them. “In some ways they [the foreign dancers] are ignorant,” she is quoted as saying, “and I think we owe it to our cause that we visit these women and invite them ... and spend time and money on teaching them our ways and manners.” That mindset is what opens the door for the novel’s heroine to get close to the dancers and is the starting point of her relationship with them. Since I am obsessed by process I have to ask about yours. What is your writing life like? It’s changed pretty drastically since I had my daughter in May. I used to work steadily for about five or six hours every weekday, but now I work my writing time around her napping and playtime schedule. On a good day I can squeeze in about three hours. Although my progress is slower, I’m trying to make better use of my limited time. I’m not endlessly rewriting the same passages over and over again, and I’m being more diligent about researching only what I really need for the story and not letting myself get lost in the minutiae. I’m also trying to not to go overboard on the emailing, blogging, tweeting, facebooking and all that other social networking that can be so much fun, but which can chew up all my writing time if I let it. I have a couple of stories in the works that I’m really excited about. One is a contemporary story that involves belly dancing, and the other is set in the world of vaudeville in New York circa 1910. After being at it for nearly 20 years, am I a great belly dancer? No! :-)I’m very much a writer who belly dances, not a belly dancer who writes. For me, it has always been much more about having fun, appreciating the dance, and spending time with my friends. My favorite quote about writing is from John Irving. I've mentioned it before, and it basically says if you don't feel that you are about to humiliate yourself while writing, if you don't feel yourself losing control, than what you're doing isn't very vital. If you don't have doubts or fears or panic, you aren't writing hard enough. It's a hard thing to grapple with, but today I was in that place all morning, working on my new novel, which right now is called The Missing Ones. Sick with fear. Nauseous. Unable to push forward. I kept looking at the books in my office and thinking I could never write anything that brilliant. I had just finished a friends arc which had knocked me out and had me reeling. I kept at it all morning. I kept pushing into the story, trying not to hear all the voices yammering at me: you can't do this. you aren't good enough. the story is dull, stupid and meaningless and so are you. It wasn't until the afternoon that the sentences began to breathe, that they took on some life and I finally felt that exhilaration of writing. But don't get me wrong. I'm still in the middle of a quagmire of mud and emotion and rocky plot points. I could drown at any time. But the only way to go is forward. We're not religious in my household. When my son was little, we celebrated everything: Christmas, Passover (complete with the Passover Bunny), Hanukkah, you name it. We've tried to let our son figure out what it is he believes or doesn't believe, and we all keep an open mind. So this weekend, to my surprise, we are giving our son a bar mitzvah. But being us, it is, of course, not a usual one. It's something he wanted to do. It's something we began to want to do, too, just to keep hold of the cultural thread that ties us all together. My grandfather, a writer I have just one memory of (I'm two and playing with blocks and he beams at me), was an orthodox rabbi and his black silk top hat sits on top of our shelf, so maybe I feel his spirit beaming down at me or maybe I just wish that were so. Or maybe it was my son's reading of Anne Frank's Diary or the people who deny that the Holocaust ever happened. I don't know, but we felt this was significant to do. So we hired someone to come to our house and teach him a little bit about Jewish history and a lot of Hebrew. And instead of the garish 50,000 bar mitzvahs with themes like The Titanic, and a guest list that would fill a stadium, we're keeping it small. Twenty-two kids, about 8 adults. And we're having it at the hip and cool Maxwell's Rock Club! Our son will take the same stage as Patti Smith, the Ramones, and Bruce Springstein. The Club is ecstatic. This is their first bar mitzvah! They're throwing in Maxwell's t-shirts (not the ones with skulls and wine bottles, just the simple ones with just the name). The kids are going to karaoke until their throats are sore and dance, and all the adults have to do something, be it light a candle or say a prayer. Sometimes, I am deeply moved by how life unfolds and surprises you.